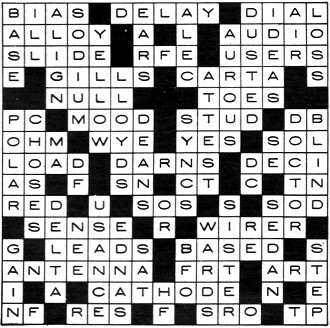 Nearly every week I create and publish a crossword puzzle filled with words and clues all of which are relevant to the realms of engineering, science, mathematics, chemistry, mechanics, optics, communications, amateur radio, etc. 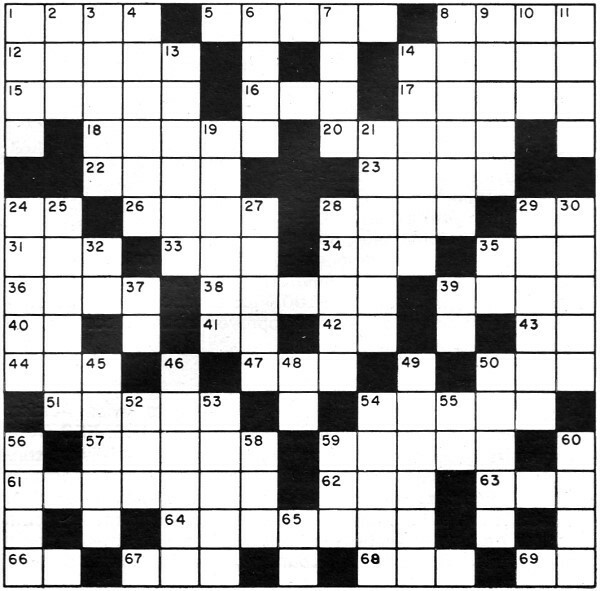 It is rare to find a crossword puzzle that contains no 'filler' type words used just for the sake of being able to construct a puzzle. I use software that takes my custom-built dictionary of a few thousand words and definitions, and fits them to grids that I create. Probably an hour is spent every Sunday making the RF Cafe Crossword Puzzles, and I really don't know how many people even bother with them. 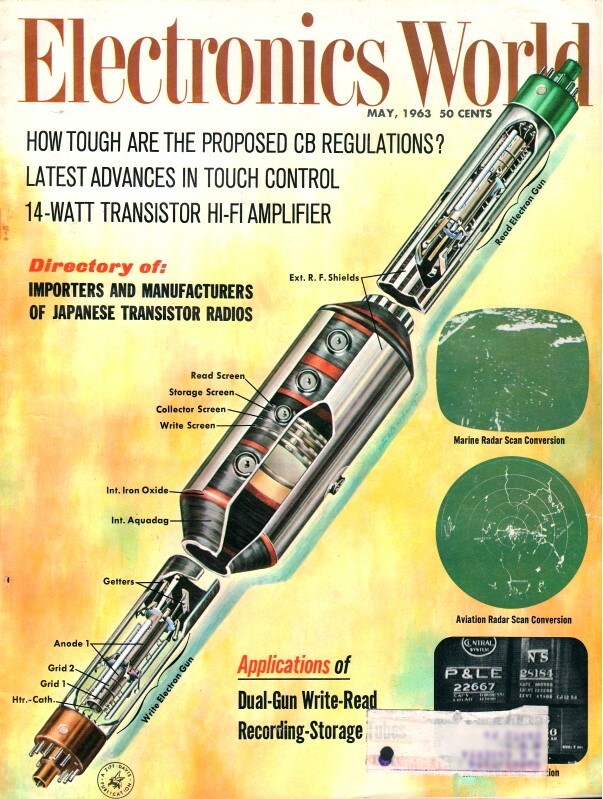 This "Electronic Crosswords" puzzle appeared in the May 1963 issue of Electronics World. While it does have a large percentage of technical words, there are still a large number of fill words as well. 5. Change in time relationship. 8. Shows station to which you are tuned. 12. Combination of two or more metals. 14. Frequencies which can be heard. 15. Record players are often mounted on one of these. 16. Broadcaster to Iron Curtain countries (abbr.). 20. Part of the title of document guaranteeing civil liberties. 24. Type of circuit board (abbr.). 28. Threaded rod attached to chassis. 33. Type of three-phase connection. 36. Output is dissipated across this. 41. Ratio indicating usefulness of signal. 42. Transformer notation on schematic (abbr.). 44. Color code for two. 57. Wires attached to components. 59. Started from and returned to one place. 61. Receives and transmits signals. 66. Measure of noise generated by amplifier (abbr.). 68. Hit show ticket status. 69. Place for making measurement (abbr.). 4. Element found in salt. 8. Tidied up the house. 13. Color code for four. 24. Pattern traced by some types of antennas and microphones. 28. Locks signal to a reference. 30. Connection which must be made where it can't be seen. 45. Type of three-phase connection. 54. Political subdivisions of a city. 56. Function performed by amplifier. 58. "Best" day of the week (abbr.). 59. Oscillator in receiver (abbr.). 60. Abrupt change to new voltage.